Sarah was born in 1855 in Toledo, Ohio. After the Civil War ended, her parents moved her and her six siblings to Chicago, Il. There, she met and married a fellow named Archibald Goode who was a carpenter. Sarah opened her own furniture store in Chicago. One of the major complaints her clientele had about their apartments was that they were very small, and there was barely any room for furniture. Sarah put her mind to figuring out how to optimize the space at hand and offer a piece of useful furniture. Her creation? A cabinet bed. A desk that was fully functional with drawers and space to work that had a bed hidden in it. You could do everything you wanted from storing paperclips to using the top of the desk to eat or do your taxes, and when you were ready for bed, you could open it and a full sized bed would unfold. There was a separate piece you could use to reinforce the middle of the bed. In the morning, you put the bed away and go on with the day. 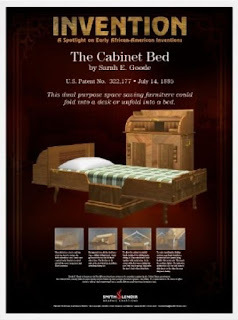 Sarah patented the cabinet bed in 1885. Sarah Goode died in 1905. The above facts seem to be mostly born out by all of the various sites I looked at and read. Now, there were lots of other things I found that seem either made up or fanciful, and possibly embellished. This site says definitively that Sarah Goode was born into slavery. Considering the fact she could read and write, that is highly suspect. I found out there was a potential other African American woman who’d gotten a patent the year before Sarah. Her name was Judy Reed. 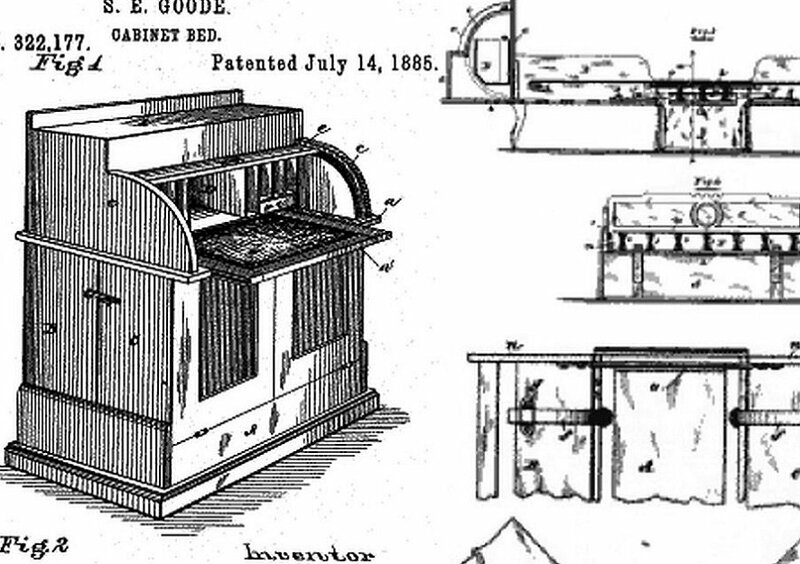 Nobody knows anything at all about Judy Reed other than she got a patent in 1884. She signed her name “X”. I am not certain why anybody thinks Judy Reed was black. Whilst searching for some kind of visuals for this post, I found a very “not an African American woman” picture listed with Sarah Goode’s accomplishments on multiple sites. 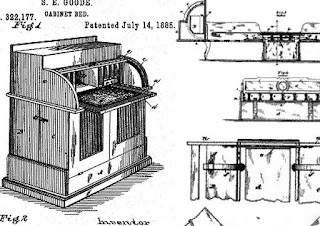 I tracked the picture down and it turns out it is from a site for a family who was chronicling their history in Wyoming The woman’s name just happened to be Sarah Goode, but there is no reason to believe she invented anything, and she is most certainly not the first or possibly the second African American woman to ever patent anything. I was amused that so many people had reprinted the picture without questioning it. All of that said, I give you Sarah Goode. She created the first cabinet bed that could double as a piece of functional furniture. Sarah’s creation was the precursor of the Murphy Bed, the sofa bed, and all the hideaway beds we have today. Day 9 – William Henry Cling – Did He Invent The Hospital Bed Before Gatch?